Blog - What are you Bringing to College? Home › About › Our Fleet Feet Blog › Blog - What are you Bringing to College? What are you Bringing to College? Approximately 43 minutes and 24 seconds. Trusting my algebra, that’s how long it would take for me to run the 6.2 miles from my house to the UW-Madison Campus. For four years, running has played a large part in my life, continually shaping me as an individual through lessons learned and values instilled. That’s why I’m taking my running shoes to college, and while some may just look at my pair of sneakers as simple jogging essentials, to me they represent opportunity, memories, and a constant reminder of hard work. From the concrete jungle of downtown Madison, to horizon-spanning country roads, to the fresh dirt and gravel of the UW Arboretum, I can take my shoes anywhere, just like my future. In this way, my shoes symbolize opportunity and freedom awaiting my university-bound future. Like a freestyle run at the Arboretum or along the UW Lakeshore path, the freedom to choose, change, and alter my route on a simple whim or spotting of the trail less traveled is the apogee of self-liberty and my favorite part of running. An utter leeway like trail running nowadays is hard to come by, but is extremely valuable as an experience one can gain much introspection and insight from. During solo trail runs, I’ve reflected on what I value most in my life and how that can shape my education. I know that with the right mindset, college can give me just as much liberty to shape my future and reflect as my running shoes lend me. Through my eyes, the University of Wisconsin-Madison is the next trail run to embark on, exploring a countless number of opportunities and learn from professors, researchers, and students alike. They are endless running paths to lead to my future through hard work and dedication. Ethylene vinyl acetate (EVA), Polyurethane, and Carbon rubber — the three imperative materials that go into manufacturing common joggers. While my New Balance 880v6s share this universal background, only mine hold my memories in their creases, cracks, and stains, making them completely one of a kind. I’ll often receive questions or comments about the mud stains caked up the outsoles of my shoes; this always puts me into a lighthearted mood as I begin to unravel the story of when my cousin Teagan and I ran through West Virginia horse trails after a rain storm. Every summer my family reunion takes place at a small resort in the foothills of the Appalachian mountains where, to a local Madison flatlander, the green grass and white-tail-inhabited highlands appear as Everest-sized zeniths. To stay in shape, Teagan and I run together, and one afternoon after hours of downpour, we decide to freestyle our way up and down the resort’s abandoned horse trails. Pounding the pavement up to the paths, we arrive at the mouth of castaway trails the backwoods have begun to reclaim. Descending the snaking passages, only shards of sun break through patches of overlapping canopy casting a guiding light on my shoes slashing and lacerating through mud-slicked sloughs. As we splatter and press on, I zig-zag across the hoof-paths avoiding growing bogs looking to envelop my foot whole. We slop descend, slosh stumble, wallow and tumble until I falter, deceived by a seemingly solid foothold, and that’s when the quagmire swallows my right sneaker up to mid calf. Lurching forward, I rip my foot out of the bog’s vise grip, running until my cousin keels over laughing, informing me I lost my right shoe 20 yards back in the muck. Bewildered, I observe my feet now looking like an impressionist’s splatter painting only to notice he’s right. Defeatedly, I wade back to retrieve my deserted shoe, laughing with Teagan the whole way. To this day, even after multiple trips through the washing machine, I still have little abstract splatter paintings across my shoes that transport me back to the earthy scents of damp air, growing moss, sweat, and the fresh mud of West Virginia horse trails. Finally, my running shoes represent the work I have put into my athletics since the summer going into my freshman year. For four years, I have put my body and mind to the test running thousands of miles in temperatures ranging from 100 degrees to 25 below. With a positive attitude and determination, I’ve taken my running shoes to varsity races, as captain of our 70-man team, and the state cross country meet; but now as a graduating senior looking back at my career, I take most pride in my sidelined senior year. Out indeterminately with severe patellar tendonitis in my knee, I realized that rehabbing this year to compete again was going to be the hardest I’ve had to work during my four years. Partnered only with my shadow and unrelenting commitment to our team, I lost count of the hours spent swimming, biking, lifting, icing, stretching, and going through physical therapy every day until I could compete again. With the season dwindling, I decided to cut my rehab short and run hurt until I was back toeing the line of our last meet in the varsity sectionals race. 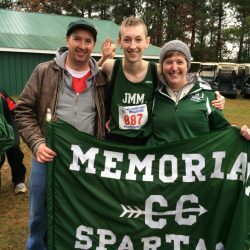 Successful and victorious may not describe my last season, but the value of my 2016 cross country season served as a self-examination that revealed a perseverance and tenacity inside me I was unaware of. My shoes are more than hard rubber and soles, they’ve been infused with my blood, sweat, and soul. My shoes were there after qualifying for the state meet. My shoes endured hundreds of miles on ice-sheeted sidewalks. My shoes witnessed endless laps in the pool until being kicked out. From the Appalachian trail to sports-med examination tables, my shoes have been with me. So when people ask me what I’m bring to college I tell them, hard work and EVA creases, memories and mud stains, self-governance and trail runs all in my joggers. That’s what I’m bringing to college.